I seem to have ended up with books from the library of the bookseller,botanist, publisher and Bloomsbury minor character Eddie Gathorne- Hardy (1901 - 1978). Not the good stuff but mostly detective paperbacks in regrettable condition and a few fascinating pamphlets from his (and his brother's) Mill House Press (discussed in last weeks posting.) We bought the 'last knockings' of Alan Ansen's Athens library and he obviously knew Eddie well and appears to have inherited some of his books. Ansen was an American poet and writer, compadre of William Burroughs and the dedicatee of The Naked Lunch. 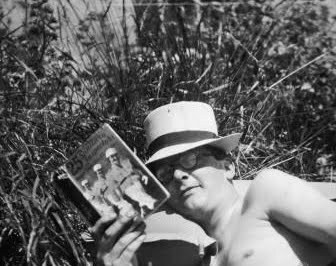 He and Eddie seemed to have shared a taste for 'cosies' (Golden Age British detective fiction) and indeed there is a photo (below) of Eddie from the Bloomsbury power spot Ham Spray in 1932 showing him reading 'Twenty Five Sanitary Inspectors' a now much wanted thriller by Roger East. 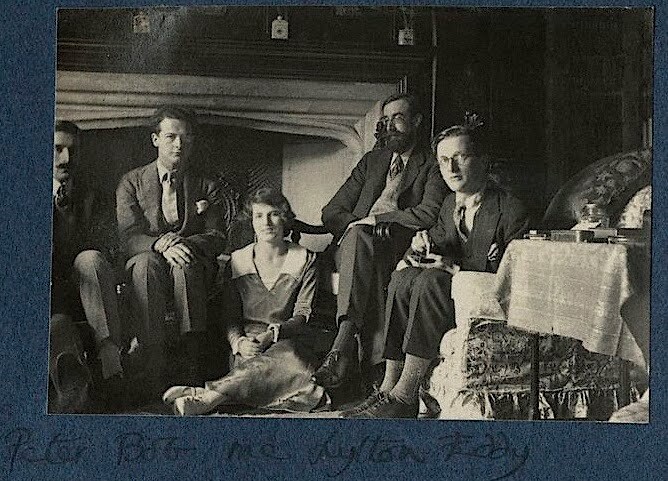 One of the books was by Eddie's sister Anne Hill ( of Heywood Hill and once affianced to James Lees-Milne) Trelawny's Strange Relations (Mill House Press, Stanford Dingley 1956) presented by her to Alan Ansen. Loosely inserted was a xerox of an obituary article on EGH from The Times by Patrick Leigh Fermor with inked notes by Anne Hill. It appears not to have been published (not on Google and not on The Times website which I joined for a day after giving £1 to Murdoch.) It is pretty fancy stuff, very affectionate and worth sharing with bookinistas, connoisseurs of literary eccentrics and lovers of minor, forgotten characters. It would be said of no-one but Eddie Gathorne-Hardy that he belonged with equal fitness to the pages of White's Natural History of Selborne and the Satyricon of Petronius. Further analogies, with correct instinct but a few decades too early, could be sought in Valmouth and South Wind, but found to a split second in date, mood and intention in Vile Bodies, and though the brief intemperance of his Oxford days and the scrapes and festivals of the young and the bright in the 'twenties London gave him an aura which never quite faded, it was a figure of strong intellectual substance and authority that vanished from the scene on June 18th. Originality and independence of mind stamped his background. 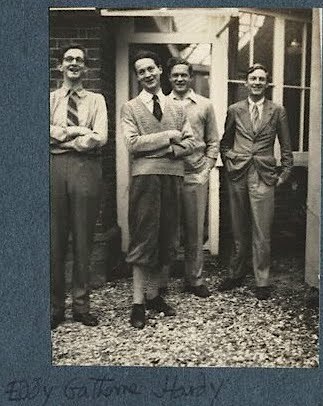 Born in 1901, second son of the Earl of Cranbrook and Lady Dorothy Boyle, he was sent to Eton and Christchurch, but while the passion for the natural sciences which he shared with his father and brothers was turnng him into a widely travelled and accomplished botanist, his years with Elkin Matthews and a bent for scholarly research made him the best known authority on the 18th Century among the antiquarian book dealers of his time. Less professionally, his pursuit of recondite lore found entertaining scope in Cornishiana- a collection of the eccentric dicta of Mrs, Warre Cornish - and in the slender but hair-raising confines of Inadvertencies where those passages of English literature which are open to comic or scabrous misconstruction are hilariously set forth. Time gradually changed him into a Peacockian figure - [for bookish] analogies are unavoidable - a sitter for the Dilettanti portraits with a dash of the great Whiggery, a sceptic Voltairian aristocrat but not a stoic for tedium, humbug, bad scholarship, and, indeed, the recent handicaps of ill-health, could set the air crackling all around him with oaths and groans. He demanded much of his friends and got it, cutting through their quandaries by never doing anything he didn't want but repaying the trouble many times over by the charms and surprises of his company. The intonation of his voice was bandied about by all who heard it and of all his traits, it is the perhaps the extraordinary gift of witty and lapidary or cumulative phrase which his friends will remember with the most lasting amusement, affection and delight. I like the look of Eddie, and I especially like that book he is reading 25 Sanitary Engineers. Looks like a great jacket, can only find an Albatross paperback on the net. Thanks for posting this. I love the way that Leigh Fermor writes. It is odd that it was not published in a newspaper.